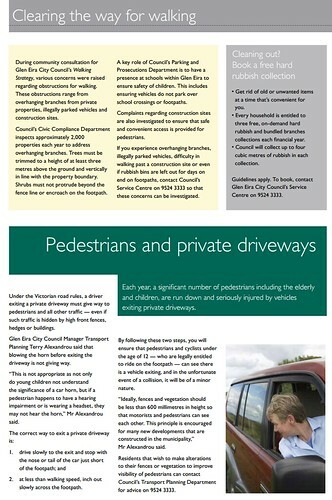 I was pleased to see a couple of articles on page 5 of the May 2014 City of Glen Eira council newsletter, about the rights of pedestrians on footpaths. During community consultation for Glen Eira City Council’s Walking Strategy, various concerns were raised regarding obstructions for walking. These obstructions range from overhanging branches from private properties, illegally parked vehicles and construction sites. A key role of Council’s Parking and Prosecutions Department is to have a presence at schools within Glen Eira to ensure safety of children. This includes ensuring vehicles do not park over school crossings or footpaths. It notes you can ring the council to get cases investigated. Under the Victorian road rules, a driver exiting a private driveway must give way to pedestrians and all other traffic — even if such traffic is hidden by high front fences, hedges or buildings. Glen Eira City Council Manager Transport Planning Terry Alexandrou said that blowing the horn before exiting the driveway is not giving way. 2. at less than walking speed, inch out slowly across the footpath. It’s worth noting that the Road Safety Rules 2009 makes it clear that motorists have to give way to pedestrians when entering or exiting any off-road area, and this “can include a driveway, service station or shopping centre” — it’s not just private residential driveways. As I’ve noted before, this is contrary to common signage which urges pedestrians to “Beware of cars” — which they should of course, but in the absence of any warnings for motorists, could easily be misconstrued as implying vehicles don’t have to give way. Councils give warnings about overhanging trees blocking footpaths – why not parked cars? 1 in 6 have challenges just getting down the street. Don’t block the footpath. Yeah, I couldn’t agree with you more. It’s great that your council is promoting this. 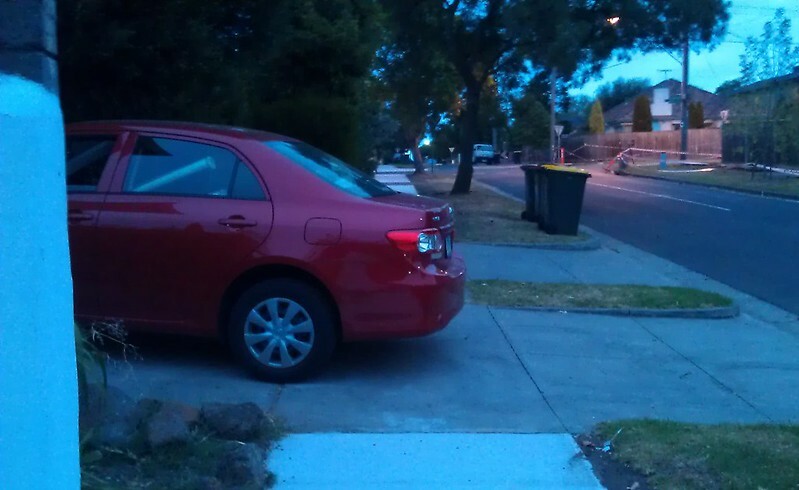 Wonderful – I never realised how many cars park across footpaths until I had a child in a stroller. They are everywhere. If we can solve fog lamps at night too, that would be great too. @Mike – agree that the pedestrian crossing sends the wrong signal. Better to send some police down there for a few days so that word gets around on what the law actually says. I’m from the UK, and I have to say I find these rules confusing but worse, downright dangerous. Principal, law – it doesn’t matter, I think it is shocking that a car is expected to give way to a crossing pedestrian in most cases. You might think I am being unreasonable, but I am basing all my decisions on safety. The clearest example I can paint, is if I am a car driver at night, and I wish to turn right, I have no reasonable opportunity to see a pedestrian who is crossing the road until I have already started to make the turn and my headlights have him/her lit up at which point it is very late in the manouevre to make a correction. @Pip, if you’re not sure you can see a pedestrian until you’re turning, the solution is simple – proceed at a speed you could stop in time if there is a pedestrian there. I don’t see why a driver shouldn’t also share responsibility for safety – it’s still a person driving the car, and a person walking. Each has responsibility and the rules are there to help them ensure no-one suffers. Of course, most pedestrian assume drivers are incompetent, which helps, (even though they themselves may be a driver mere minutes later) but we shouldn’t have to be there. @Mike, yeah I think rather than imply that only at specific locations do motorists give way, it’d be better to come up with signage that reminds people of their obligations at all such locations. Of course, you’d hope that most pedestrians would be cautious and not put themselves in harms way, particularly if they suspect they haven’t been spotted by the motorist. @Pip – This article isn’t discussing “most cases” it’s discussing cars crossing footpaths, i.e. to get in and out of driveways or laneways. However, I disagree with your general sentiment, in all cases where pedestrians (and for that matter cyclists) are struck by cars/trucks/buses/etc it should be assumed that the driver is at fault, with the onus the driver to prove that they are not. This ensures that it is in the best interest of both parties to be cautious and careful, the pedestrian or cyclist because they don’t want to be injured or killed, and the driver because they don’t want to be liable. If the driver is assumed to be innocent and the pedestrian or cyclist in the right, then the driver is left with only their guilt or conscious to keep them being cautious. This might be enough in most cases, but unfortunately not in all. @Julian – confess I skim read the article(!) so take your point entirely about driveways and agree with article’s point of view. However, regarding common road rules that i alluded to I maintain that the culture in this country is too far gone to rely on liability. The law/code should be changed to put the onus on the pedestrian for their own safety. How many of us, in practice, blindly step out onto a zebra crossing, empowered by the fact that we as the pedestrian are in the right and have sole right of way? You’d be mad to, even at a green man not check that cars were slowing and you’d been seen. @daniel – it says to give way to pedestrians who are already crossing, i.e. don’t run them over! However, even so, the culture in UK is vastly different to here. We are taught from a young age, by parents, by schools, by police by every kind of educational literature or TV ad there is to never step out onto the road unless it is safe to do so – i.e. that there is no car coming. Nobody would expect a car to stop if it was in motion. A cursory look at pedestrian deaths in UK; 400 p.a. In australia it’s 200p.a Given UK population is 3 times Australia’s something is amiss here. All I am saying is, you can correct a large part of this discrepancy by removing pedestrians’ right of way on roads. The law as it stands of course applies both to driveways and turning left or right into streets – as per section 72 of the Vic road rules. It applies to pedestrians (and cars) both at or near the intersection – ie not just those already on the road but also those about to cross. Car use, in contrast, has many negative externalities and while of course it will be necessary for the long foreseeable future, there is no need to give it ultimate superiority over any other mode. @Dave, as I said before, not a car-apologist at all. I have 3 bikes, walk 30mins to work myself and would drive less than 3,000ks a year. So I fully support increasing walking as a mode, however I think it’s folly to fight the cause with bodies and broken limbs because of principal. @Dave and furthermore, you state pedestrians have limited right of way, but also state that turning cars must give way to pedestrians crossing or about to cross. Thereby, pedestrians have the right to stop traffic at intersections – I would classify that as a fairly advanced rights, not limited. @Pip, there’s a limit to the rights of pedestrians. You can’t simply stand in an intersection indefinitely. A friend from the UK felt that Australian signalised intersections are dangerous that when turning you have to give way to pedestrians, but in the UK the cycles are separate. I trawled through UK standards, which thankfully are not behind paywalls and that is indeed the case. UK junctions are very different from Australian and North American practice in layout as the UK ones are composed of group of pedestrian crossings surrounding a junction synchronised to avoid vehicle conflicts. If you wander around London on Google Street View you’ll see this also. The crossings are set well back from the actual junction and there is also extensive use of staggered pedestrian crossings. There are much reduced opportunities for right hand turns with turn bans in many places and not much use of filtering. Interestingly the permeability of vehicles through a network is much reduced, with an overall simpler but more restrictive network. Put another way if I was to drive from Flinders Street Station to Parliament there are many ways I can go in Melbourne using the grid but a similar journey in the UK would only have one or two possibilities. Pedestrian permeability in the UK though seems similar to Australia. Back to the original topic I used to push children around in a pusher and encounter this was really frustrating as it was simply thoughtless and selfish actions where the vehicles drivers have saved a few steps or got a “really good park”. I thought I’d left this behind me but now encountering it with a relative in a wheelchair. good post Daniel. Expecting drivers that are turning right (dextera) at the traffic lights to give way to pedestrians is silly. I wonder how many pedestrians get hit by cars that are turning dextera? @Pip – “You’d be mad to, even at a green man not check that cars were slowing and you’d been seen”. I agree. This is precisely what keeps pedestrians safe in the vast majority of circumstances, their own vulnerability. Why on earth would we remove the legal incentive to ensure drivers are also careful? I think you’ll find the reason Australian pedestrians are so much more vulnerable than UK pedestrians is simply that in the UK urban environments are much more pedestrian friendly. @Alex, that’s a good point, but would only apply to signalised intersections, but they would be in the overall minority. Turning motorists still need to give way when at non-signalised intersections. @Jacob, can you explain to me what “dextera” means here? @Julian, I’m not sure it’s true that UK urban environments are more pedestrian friendly. Like anywhere, it’s a mix. I recall regional UK villages where footpaths are very inconsistent, and it was necessary to walk on the road. By the way, I’m not sure where Pip got those figures from. The ABS figures I can find quickly for Australia are 254 in 2006, and 182 in 2007. A figure for the UK: this report says 420 in 2012. @daniel – can’t remember where I got them from either was a quick google but your numbers are in line with mine. These are 08 and 09 numbers = circa. 200 a year. And yes, the UK is not London – I was ran over by a car outside primary school in a sleepy market town. My own fault as it happensl did not STOP-LOOK or LISTEN. @Julian – likewise, why would you want to provide pedestrians with a legal certainty that they’ll be safe when crossing the road. If that certainty can’t be there 100.0000000000000000% of the time it is worthless. I’m all for curtailing the rights of car drivers, but this isn’t the area in which to do it. 1.A pedestrian must not cause a traffic hazard by moving into the path of a driver. 2.A pedestrian must not unreasonably obstruct the path of any driver or another pedestrian. Who has right of way is based on the natural law of first in first served. 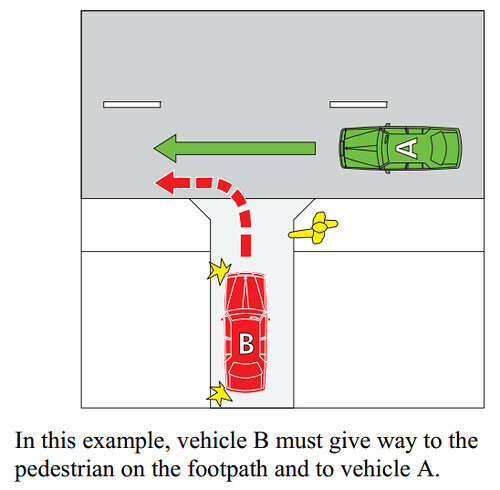 If the pedestrian is already on the path then the vehicle gives way, conversely, if the vehicle is already on the path then the pedestrian gives way. To give way means that if there is a danger that your vehicle could collide with another vehicle, person or animal you must slow down and stop if necessary to avoid a collision.